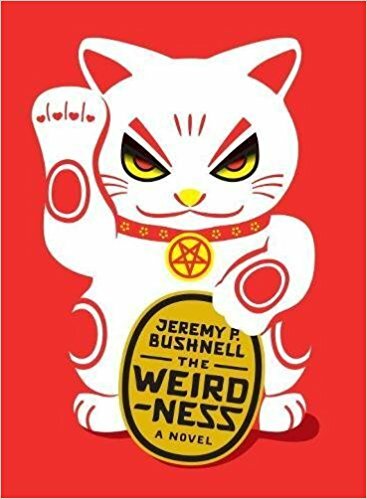 I read this 2014 novel by Jeremy P. Bushnell as a tiny act of defiance against myself, and can report that I showed myself up. Normally, I don’t want to let myself enjoy comedy created prior to the Trump Singularity. I feel driven to wear hairshirts for enabling that event, so denying myself “pre-war comedy” feels natural. My unfortunate friends have had to hear me hold forth more than once how SNL’s glorious David S. Pumpkins skit was the last funny thing visible to us before we chose to fork into the darker timeline, and we deserve to have lost its light forever. Requiescat ay papi. Cover-copy cliché as it sounds, I did in fact burst out laughing again and again at the The Weirdness, more or less as intended — and certainly more than I expected. Its delightfully absurd story of a drifting writer careening among sorcerers, secret societies, and sandwich artists after the Devil tasks him to fetch a MacGuffin brings to mind a streamlined Robert Anton Wilson, replacing self-indulgent excess with gleeful briskness. I read it quite quickly and had a great time! Prior to reading The Weirdness I felt sure that I lacked the willpower to enjoy any purely prose-based comedy created on the far side of that awful event, so I feel relieved and maybe a little emboldened to discover otherwise. My encountering a familiar name in another, newer book a couple of months ago helped encourage me to give this one a try, authored as it is by another personal acquaintance from common creative circles. I expect that my personal genre of “stories published by people I know” will only grow as the years go on, and it shall behoove me to get into the habit of enjoying it all.